Though dismissed by hard-core leave-no-trace campers (who don’t so much as move a rock for fear of affecting the area), glamping can still be an environmentally sound outdoor experience, even if it does include creature comforts (like not having too many creatures inside your tent). Jennifer Colin, "Camping? Yes. Roughing It? Not Quite. ", The New York Times (9/14/08). While the word "glamping" is new, the concept of luxurious tent-living is not. In the sixteenth century, the Scottish Duke of Atholl prepared a marvelous glamping experience in the Highlands for the visiting King James V and his mother. Here, the Duke raised lavish tents and filled them with all the provisions of his own home palace. See Robert Lindsey, Sixteenth Century Glamping, The Atholl Hunt. The exquisite ornamentation both inside and out of the tents used by the Ottoman sultans made them imposing dwellings fit for a ruler. 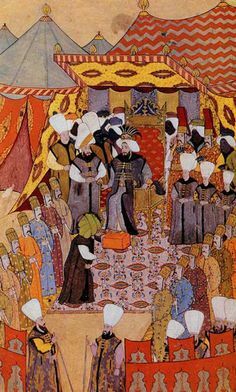 On ceremonial occasions tents served to create a splendid theatrical setting, as we see vividly portrayed in miniature paintings depicting banquets, audiences and celebrations which took place in the imperial tent complex over the centuries. The imperial tents were richly decorated as if they were pavilions, and often had designs resembling tiled panels, usually in floral patterns, either in appliés work using cloth of different colours, or embroidered in various stitches using silk and metal thread. Professor Nurhan Atasoy, "The Ottoman Tents," Turkish Cultural Foundation. Fast forward three centuries, and we find more examples of early "glamping." In the 1920's, African safari became the thing to do among wealthy Brits and Americans. For each white tourist, up to 60 local porters would be needed to carry belongings, tents, and supplies. From electric generators, to folding baths, and cases of champagne, white travelers were afforded every domestic luxury while on adventure. Bartle Bull, Safari: A Chronicle of Adventure (1992). Today's concept of glamping has it roots in these earlier forms of luxury camping. In a positive twist on these old forms of tent-living, however, glamping today is not within the exclusive purview of rich, white aristocracy. To the contrary, some form of glamping is accessible to most travelers: a quick search for glamping accommodations around the world reveals an incredible range of per night prices. Even more importantly, whereas 20th century safaris were built on the backs of underpaid or enslaved African porters, today's glamping sites are generally owned and run by local entrepreneurs. Glamping gives local business people the opportunity to compete against international chain hotels by offering intimate, eco-friendly experiences that the big chains cannot. Built to minimize environmental impact, glamping makes it possible for travelers to comfortably trek the world without leaving their footprints everywhere they go. While the number of international glamping options has skyrocketed since 2008, the main philosophy behind glamping has remained the same: sustainable, quasi-outdoor lodging that offer travelers unique, but comfortable, experiences in nature. 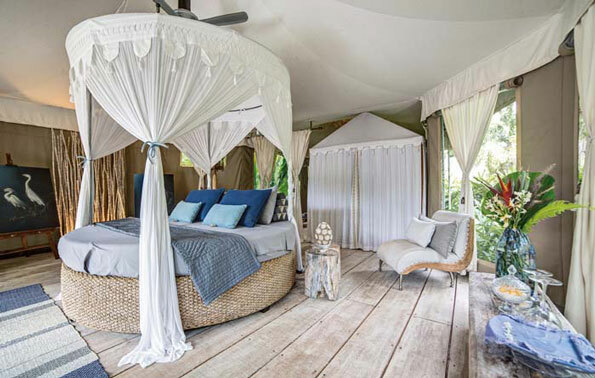 For a prime glamping example, visit Sandat Glamping in Bali. Set amongst the rice paddies of Ubud, Sandat houses guests in yurts and lumbungs, typical structures used as rice warehouses throughout Bali. The structures have been built to have zero environmental impact and to fit seamlessly into the stunning Bali landscape. Although traditional rice warehouse on the outside, the lumbungs are decked out with beautiful decorations and all the essentials of a modern hotel on the inside.